Have you ever felt like your dream job doesn’t yet exist? Like you’re searching for something impossible? That might be the case—but if you can imagine it, you can make it happen. That’s exactly what influencer marketing expert Brittany Hennessy did. Not too long into her journalism career, Brittany was sent to hang out on a cruise ship with Rihanna and tweet about it (say whaaa?). Major job perks aside, the experience opened her eyes to the budding power of social media. This led her to discover her zone of genius as Senior Director of Influencer Strategy and Talent Partnerships at Hearst Digital. As the first person ever to hold this title, Brittany booked influencers for digital publications like Seventeen, Cosmo, and Esquire—to name a few. In this role, she really experienced the world of influencer marketing from the brand perspective. She also saw allll the mistakes influencers make when working with brands—from way undercharging to ignoring the fine print in contracts. 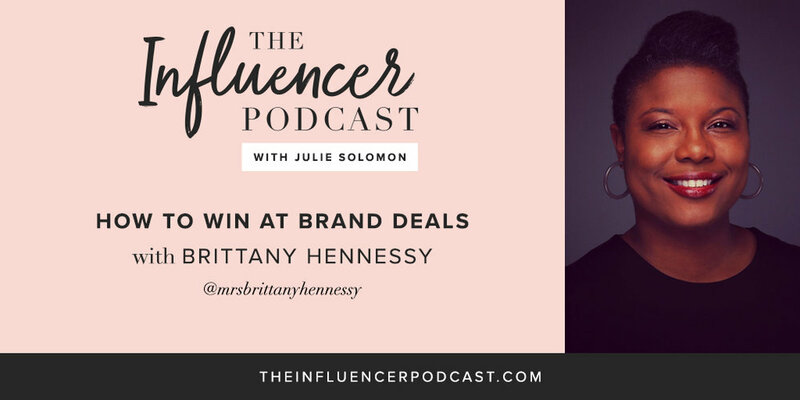 Brittany has since created a mega resource for influencers to develop win-win relationships with brands. That resource is the best-selling book Influencer: Building Your Personal Brand in the Age of Social Media—and it’s a MUST read for anyone building an online brand and business. On today’s episode, Brittany is answering some of the toughest influencer questions I get from my followers, complete with super-specific, step-by-step advice. Trust me, you don’t want to miss this one! Did you know that we love to dive into your thoughts and feedback on our newsletter? We share even more from the guests, like their favorite apps and the best career advice they’ve ever received (plus more cool stuff), along with YOUR thoughts too! Make sure to join in on the fun here. You know I love to chat….especially with you! Snap a screenshot and tag me and @mrsbrittanyhennessy on Instagram as you’re listening to this week’s episode. And remember to hashtag #theinfluencerpodcast, that way I can share your screenshot on my story too!